I had an interesting conversation with Gudjon Mar Gudjonsson the founder and CEO of OZ. He asked a very good questions, he has been trying to find a SCRUM like methodology for Sales and has not been able to find it. He was being very modest, Gudjon is great at sales and he is also a serial entrepreneur, so I had to dig deep to find out why he was trying to find this methodology. After a little bit of thinking, I understand, he wants to scale his team to adopt an approach that is repeatable, consistent and can deliver results in small cycles, would that not be great for a sales process? i.e You have incremental progress towards the ultimate sale of your product or service? I have written before about Sales process, again it is not rocket science but harder because in rocket science you just need to deal with physics and mechanics, in sales you need to deal with one individual at a time and each one of us arrives at a buy decision for totally different reasons. Anyway, I thought maybe I will attempt to write about process and methodology and references for sales or business development similar to a Scrum methodology for Software development. 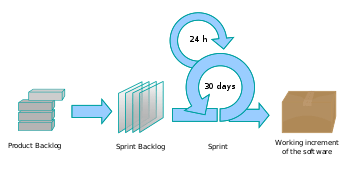 There are numerous blogs and websites describing the scrum process, it is quite effective I have seen it adopted, applied and deliver excellent results in delivering product releases on time. Experienced sales and business development executives intrinsically live a scrum like process when it comes to what they do. They are extremely disciplined, they have the network and/or continually build their network to more or less deliver on a sales. They understand the sales cycle and they iterate and deliver results. This is one of the reasons why seasoned, results driven sales executives are hard to find because they are busy creating value for their customers. Some of the things that a sales process needs is a simple tracking tool, I have seen excel used very effectively in this or one can go crazy in implementing sophisticated CRM systems and get sucked into the minutia of the process, the same I have seen happen in Scrum. I think the important thing is to focus on the end result. A good sales process should deliver… yes, you are right closed sales. The people following the process is more important than the process. I have had the pleasure of working with some excellent sales executives, they just know what to do, they understand their customer needs, wants, articulate solutions clearly and close sales like it was as simple as 1,2,3. Good Sales executives are charismatic, empathetic, listen well, are problem solvers and are driven by results. Pain. Unique Selling Proposition. Compelling Event. Champion. Key Players and Aligned Purchasing Process. This is always the problem with learning, the more you learn the more you realize you need to learn more. Methodology and approach is only like having a map of a region, the key is always the person holding the map and what they do with it. I believe very strongly it all depends on the person in charge of sales efforts. So, if you want to get really good at sales you need to start working on yourself, i.e inside out, you need confidence, you need to believe in what you are selling and you need to understand the product or service that you are selling, it requires hard work and discipline and persistence. ← How should we export Renewable Energy from Iceland?